Andrey signed up for a tour with the SAC and asked me whether I wanted to come. Sure. Initially planned for Saturday we moved the starting date to Friday due to an uncertain weather forecast for Sunday. The group consisted of Andrey, Andrei, Dario, Torsten, Kornelius and me. Very unusually for such a trip we had not one, but three tour guides in Kornelius, Torsten and Andrei. This made for a very strong group. In fact I turned out to be the laggard, which is quite unusual for me. Starting after work on Friday we took the car up to the Räterichsbodensee dam at 1767m and hiked from there to the Bächlitalhütte at 2328m. We arrived in a drizzling rain just past sun down, the two hour approach taking us just 1.5 hours. A quick and early breakfast at 4 o'clock in the morning and we are leaving the hut at a quarter to five. Torsten leads the way. He has done this trip several times before and his head-torch could flood a soccer stadium, making it ideal for finding the route through glacier debris in the dark. We scramble up the glacier for a bit before we decide to stop and don crampons and helmets. 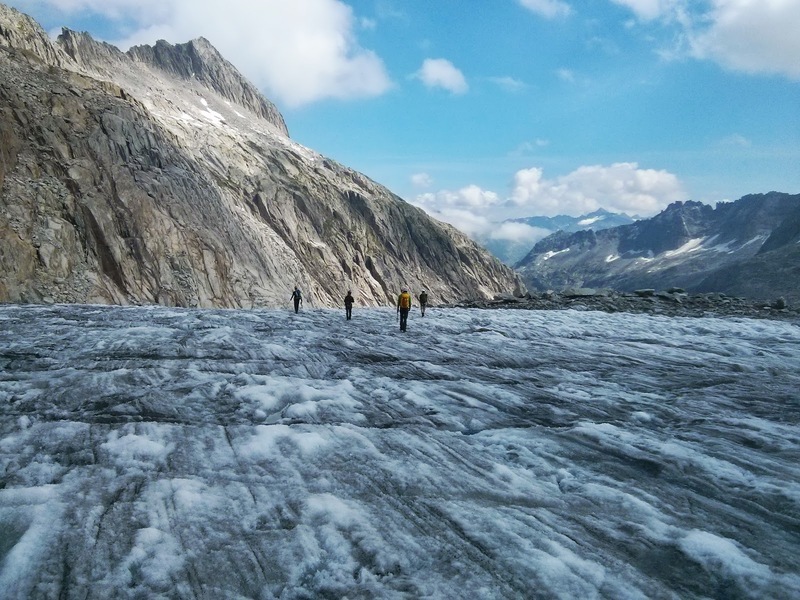 The glacier is aper (snow-free), making crevasses less of a risk. However, it is frozen solid with blank ice and carries lots of gravel. It is slippery, and rocks zipping down the slopes are a concern. We split up into three rope-teams: the "Running Russians", Andrei and Andrey lead the first pitch at dawn. Kornelius and I are next, followed by Torsten and Dario. The first pitch is supposed to be the crux and we have to decide whether we want to wear hiking boots or climbing shoes. In the end, I'll be the only one wearing climbing shoes all the way to the summit. A decision my toes hate me for. On the other hand there have been some tricky bits of climbing where I did profit. The rock is painfully cold at first, stinging our exposed fingers. Luckily the weather turns out to be picture perfect and once the sun comes around it is a joy to be climbing on the ridge. 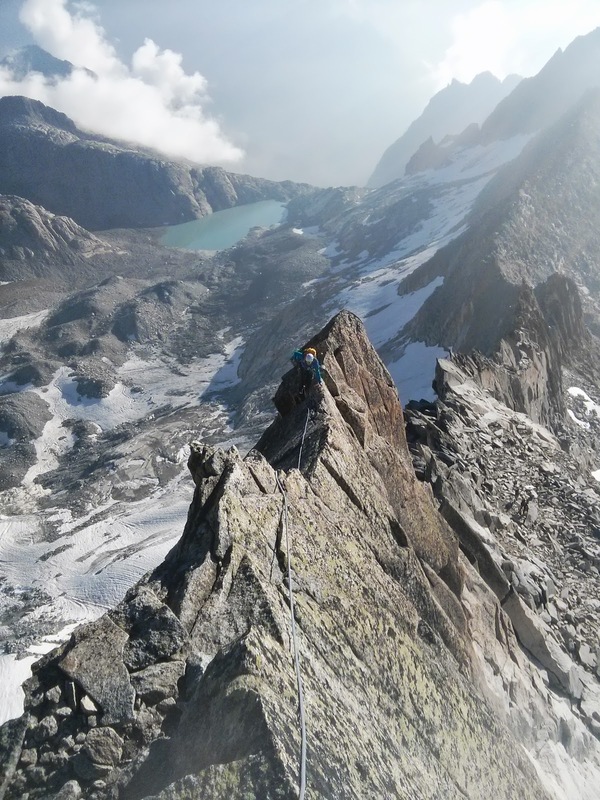 We are making good progress, oftentimes simulclimbing with one or two pieces of gear between the two of us, other times protecting alpine style, just slinging the rope around some boulders or flakes and counting on the rope drag to catch a fall. The terrain is mostly easy with some exposed bits. Although you'd think route finding following a sharp ridge should be trivial, we deviate from the intended line a couple of times. One section in particular was a bit weird. 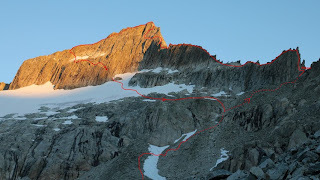 The topo marked a short rappel which I was specifically on the look out for. Somehow we completely missed it though. So either it was easy enough that we down-climbed it without noticing or we just climbed an alternate route. The greatest danger on this trip were probably loose rocks. Andrei took a short fall when some broke off. Torsten intentionally threw a lose, head sized boulder down the cliff. Smashing down the wall it broke into several pieces, giving off a strong sulphur smell. As the day grew warmer we witnessed lots of spontaneous rockfall on the mountains all around us. You'd just hear the loud rumbling or see rocks tumbling down the glacier. You really don't want to be anywhere near something like that. Early morning on the frozen glacier. 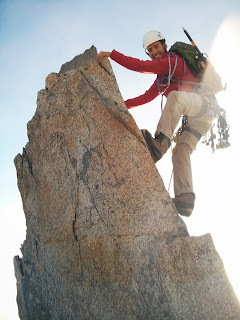 Andrei leading the first pitch at dawn. A window in the clouds. Dario enjoying an exposed fin. Our approach - the ridge on the left. Stowing away our crampons. The start of the route in the background.